If you plan to view or listen to any media on your Windows Vista computer, it’s a good idea to learn how to adjust the volume. In fact, in some situations (like at a library), even the normal Windows operating sounds can be a distraction. 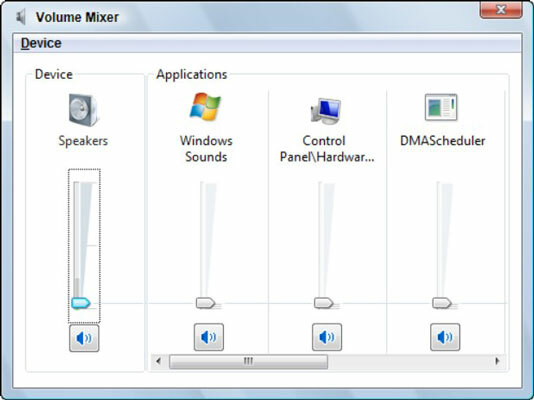 Learning how to use the Windows Volume Mixer can save you some embarrassment down the road. Today, many keyboards include volume controls and a mute button to control sounds from your computer. Some even include buttons to play, pause, and stop audio playback. Having these buttons and other controls at your fingertips can be worth a little extra in the price of your keyboard. Choose Start→Control Panel→Hardware and Sound. Click the Adjust System Volume link under Sound to display the Volume Mixer dialog box. Another option is to right click the Volume button (which looks like a little gray speaker) in the System Tray and choose Open Volume Mixer from the shortcut menu. Move the Device volume slider to adjust the main system volume up and down. For sounds played by Windows, adjust the volume by moving the Applications slider. To mute either main or application volume, click the speaker icon beneath either slider so that a red symbol appears. Click the Close button twice. Here’s a handy shortcut for quickly adjusting the volume of your default sound device. Click the Volume button (which looks like a little gray speaker) in the System Tray. To adjust the volume, use the slider on the Volume pop-up that appears, or select the Mute check box to turn off sounds temporarily.